Ship Your Shopping Home When You Travel? Are you a shopper? If you love travel and shopping, you might want to ship your shopping home. ...and if you want to carry it around with you or not. You might want to ship your shopping home rather than try to pack it in your suitcase. With today's airline baggage fees, this could save you money, but that's not necessarily true. How Do You Ship Your Shopping Home? So where can you go for this service? We did ship some paperwork and clothing home for an uncle one time from Germany using their postal service. The post office had a variety of boxes we could use, and it wasn't too expensive. There are those big international shipping services like FedEx and UPS. You can find them around the world. And there are lots of shipping services popping up just to ship suitcases. Sometimes at special events, they are set up to help you ship your shopping home. 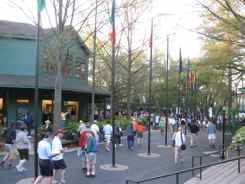 We attended the Masters Golf Tournament a few years ago with my brother. He about bought out the gift shop early in the morning. We couldn't carry the purchases with us, but fortunately, UPS was all set up right there, and his packages were on their way home in only about 5 minutes! If you buy large pieces, check to see if the seller will send them to you. If you read travel magazines like we do, you have probably read horror stories about this. We've had friends get the merchants they bought things from send those purchases home, and they got their items just fine. Our only experience was shipping a large carpet home from India. Of course we did have to pick it up and take it through customs. The vendor even sent us an e-mail asking if it had arrived safely. You are trusting that they will follow through. Once you're home, it's hard to follow up on if something hasn't been shipped or something got broken. 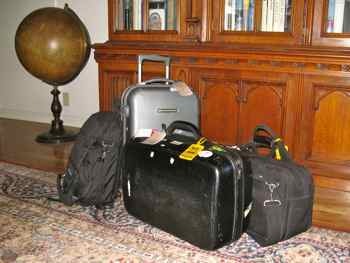 We do try to keep our souvenirs small enough to carry on with us.. that large carpet aside. OK... We recently carried home a camel saddle bag from Oman. It was bigger than a carry-on bag, but we wrapped it well and tried to take it on the plane. They let us take it as far as the plane door, then the flight attendant said we'd have to check it. At least we avoided the baggage belt for that first part of the trip. If you're on a long trip, and you collect lots of brochures or books, they're heavy to carry home. It might be cheaper to mail or ship them home than to pay than to pay for excess luggage. Mostly we try to buy souvenirs that are small, pack flat in our suitcases or fit under the seat back in front of us. Could You Buy It At Home? If it's going to be expensive to ship it... could you buy it at home in an import store for less? Would it be cheaper to pay excess luggage? Remember, if it's heavy.. as in overweight, that might be more than you think. We also take a small collapsible bag that we can fill and check if we get really carried away with purchases. We think this is a cheaper option than shipping your shopping home.... and it will arrive home when you do... at least it should! Should you ship your shopping home or just try to pack it? Depends on what you buy.... we LOVE our carpet from India! 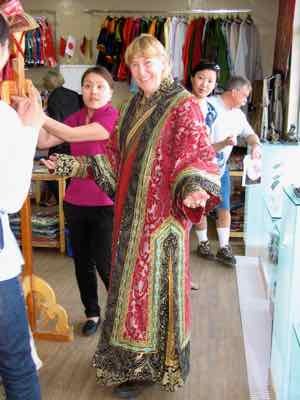 I carried my Mongolian outfit home in that collapsible bag... I love it too.